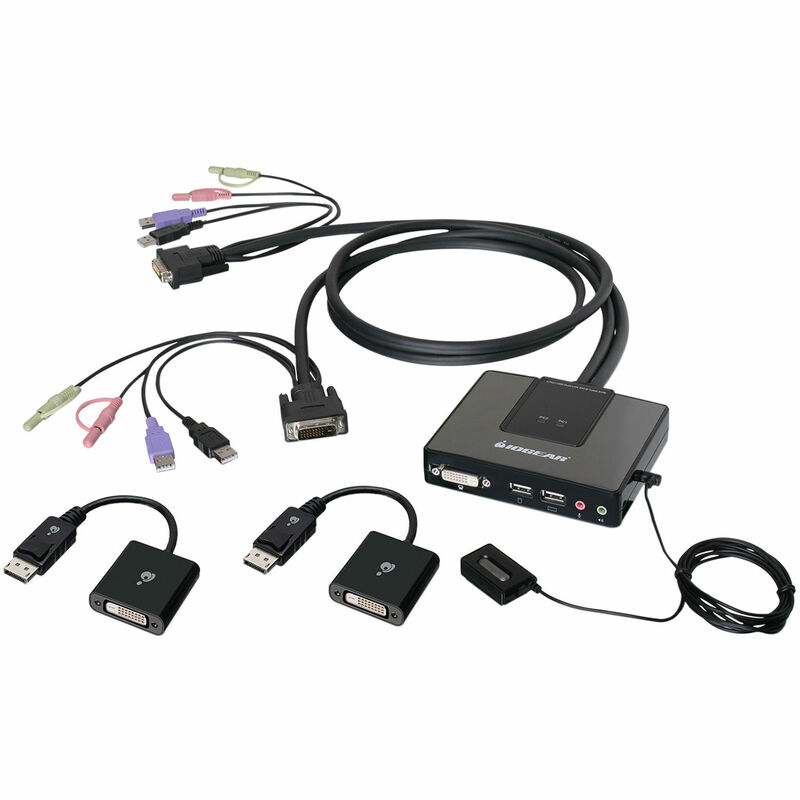 This IOGEAR kit provides one 2-Port Dual-Link DVI Cable KVM Switch with Audio as well as two DisplayPort adapters, so you can control two DisplayPort desktop computers with a single console system that has a DVI monitor. The adapters convert the ends of the switch's integrated cables from a DVI connection to a DisplayPort interface. The 2-Port USB Dual-Link DVI Cable KVM Switch with Audio from IOGEAR is a simple way to share one dual-link DVI monitor, mouse, keyboard, speaker set and microphone between two different computers. The product supports 32-bit color at resolutions up to 2560 x 1600 and its mouse and keyboard emulation ensures uninterrupted operation when switching between computers. There are two convenient switching methods available to use with this switch. The first is a simple push-button remote that easily fits anywhere on your desk, and the second is via hotkeys that allow you to independently switch and control the functions between computers. Equipped with IOGEAR's DynaSync, which provides the EDID support for Windows 7, this technology remembers your monitor's ideal resolution and refresh rate. The switch can then boot up all of your computers simultaneously, and switch back and forth between the two computers quickly--while still maintaining the ideal resolution of the monitor. Whether you need to quickly toggle between PC, Mac, or Sun hardware, the 2-Port USB Dual-Link DVI Cable KVM Switch from IOGEAR provides an easy-to-use Plug-n-Play solution to share and switch between devices. One dual-link DVI console controls two dual-link DVI or USB computers. With a resolution of up to 2560 x 1600 at 60Hz. Port switching is possible via remote switch button, mouse, or hotkeys. Hotkeys allow independent KVM and audio switching between computers. USB 2.0 Peripheral Sharing is possible via the mouse port--Connect a powered USB hub to expand your USB connectivity. Mouse emulation must be disabled for this feature to function correctly. USB mouse and keyboard emulation is available, for error-free boot-up and instantaneous recognition when switching computers. IOGEAR's DynaSync technology reads and remembers the monitor's parameters (EDID) so there is no delay or change in video resolution when switching between, or booting up, computers. IOGEAR's DynaSync provides the EDID support for Windows 7. Power-On Detection--If a computer is powered off, the switch will automatically toggle to the next powered-on computer. Mac and Sun keyboards are supported, re-programmable Hotkey activation accommodates keyboards without a Scroll Lock key, and mouse emulation can be disabled to support a mouse with special keys. Plug-n-Play ready, no software is required to run, and the Firmware is upgradeable whenever the updates are made available. Microphone and 2.1 stereo sound are supported. WEEE and RoHS compliant hardware. The Active DisplayPort to DVI Adapter from IOGEAR is used to convert a DisplayPort output to a DVI output. Use it to connect your computer or laptop or a DVI based display, projector, or TV. An active adapter is needed for connecting more than two displays to a video card. Moreover, this adapter supports resolutions up to 4K 3840 x 2160 at 30 Hz, and is plug-and-play compatible, so you won't have to worry about additional power plugs or installing drivers. Box Dimensions (LxWxH) 9.3 x 6.5 x 2.9"
Box Dimensions (LxWxH) 7.0 x 4.0 x 0.8"
2-Port Dual-Link DVI Cable KVM with Audio Kit with Two DisplayPort Adapters is rated 1.0 out of 5 by 1. Rated 1 out of 5 by Florin from Poor Product In July 8, 2018 we ordered an Iogear 2 port Dual-link DVI from B&H Photo Video, but I only used in November 18, 2018. The Iogear is not working. It recognized only the monitors. It doesnt recognized the keyboards and the mouses. For the keyboards I tried 3 different models: Logitech G19, Asus Steel Series and Asus Rog. For the mouses: Huge trackball and Asus mouse. OS is Windows 7 and Windows 10. We followed step by step the installation guide, but nothing! We tried to download the firmware for but it fail to install. We looked into description it wasnt update from 2012!!!! If you look in overview is seams to be the best of all, multifuctional … but if you look in requirements you need a “Standard 104 key wired USB keyboard” and “Standard 2 or 3 button wired USB mouse”. What kind the joke is this?? We are in 21 century.... We contacted Iogear to try to find a solution, but they dont have one, so now, to be able to use this KVM we have to buy a keyboard and a mouse. This is very good! !